Both pursuing their dreams of making movies, Michael Blake and Jim Wilson first met in 1977 while attending the Berkeley Film Institute. After leaving the school, they each went their separate way but a chance meeting reunited them in Los Angeles in 1981where Wilson pitched an idea for a "gambling" movie to Blake. Soon, Blake was hired and Double Down, later changed to Stacy's Knights, was written. An young, unknown actor, Kevin Costner, was cast in the male lead and, although the movie, released in 1983, had no major impact, a friendship between Blake, Wilson and Costner was forged. In 1988, Blake approached Costner with an idea for a movie about Native Americans. Costner, already a star, urged Blake to write a book instead of a screenplay which Blake reluctantly did. A year later, the novel Dances With Wolves was completed and Wilson took on the job, not only of getting the book published, but also to make Costner read it. Over 30 publishers passed on the novel before Fawcett picked it up and released it in paperback on August 12, 1988. To Blake's chagrin, the cover art of this edition was that of a romance novel and, when asked, Fawcett revealed they had no plans to go into another printing or further promote the novel. They advised Blake to "write another book." Wilson repeatedly urged Costner to read the novel but it wasn't until his commitment on Field of Dreams had concluded that Costner finally did so. After reading it, he knew he would make it into a movie and, putting up $75,000 of his own money, Costner quickly optioned the rights and got pre-production going. From the beginning odds were against the production. Not only were they, a first-time director and an inexperienced producer, pitching a western by an unproven writer at a time when the genre was considered dead. The script they all liked, and had agreed upon, would translate into three hours on the screen, way too long by any Hollywood standards. In addition, about a third of the dialogue was spoken in the Native language of the Comanche and the movie would have to be subtitled. And the budget was estimated at $16.7 millions. As they were turned down by every major studio in Hollywood, Costner's passion for Dances With Wolves, and his determination to get it made, grew. He decided to dedicate all his time to the project and turned down several leading roles in movies that would later become box office hits. Together with Wilson, Costner continued to pitch the project. But, refusing to compromise on the budget, the authenticity called for in regard to the language and the characters, the overall length and content of the screenplay, the team were unable to secure a commitment, let alone the budget. The original $75,000 all but depleted, the production finally caught a break when French-Canadian movie maker, Jake Eberts, and Guy East, a British film producer and sales agent, recognized the potential of the movie, got involved and, putting up one million dollars, ensured the continuation of pre-production. Despite reservations voiced by everybody involved, Costner insisted on adding to his responsibilities by playing the lead role of Lieutenant John Dunbar. He also cast an unknown actress, Mary McDonnell, as his leading lady and, staying true to the vision of the movie, broke with Hollywood practice of casting white actors in the roles as Native Americans. Armed only with pictures of a Civil War uniform-clad Costner on a horse, Eberts and East raised $6.7 millions from foreign investors. Meanwhile, finding the perfect shooting location posed its own set of problems. Not only would the location have to be authentic, it also called for the presence of a substantial buffalo herd and a significant number of Comanche speaking their native language. These three 'location demands' took the production from Mexico to Canada and, upon discovering that the Comanche language was all but dead, lead them to South Dakota, the Triple U Ranch and their private buffalo herd of 3500 heads and the Lakota Sioux on the Rosebud reservation. On July 17, 1989, $10 millions short on the budget, principal photography on Dances With Wolves began. The many stunts and overall physicality of the movie, the harsh weather conditions of South Dakota, the unpredictability of working with animals, the actors', both white and natives, difficulties with learning the Sioux language, and the production team's insistence of keeping everything as authentic as possible, inevitably resulted in budget overruns and inflation of the shooting schedule. Still, Costner and Wilson, primarily due to Costner's prior working relationship with the studio, managed to convince Mike Medavoy, Chief of Orion Pictures, to commit $10 millions to the budget, and together with an additional $3 million of Costner's own money, they finally had the money needed to finish the film. On October 19, 1990, after 138 days of shooting, a 'garage sale' where props and costumes from the movie were sold to raise money for the the 2 months long post-production, and successfully fighting and changing a R-rating to a PG 13 rating, Dances With Wolves, 3 hours in duration, was released in a limited number of theatres. On November 9, 1990, its wide release followed. Despite being dubbed "Kevin's Gate" and "Kevin's Vanity Project" by Hollywood critics and pundits skeptical, it all paid off. The details to historical accurate costumes and sets. The subtitled Lakota Sioux dialogues. The casting of Native actors, most unknown and untried, none, except for on-set language teacher and actress Doris Leader Charge, mastering their native tongue The two weeks long, one million dollars buffalo hunt that nearly cost Costner's his life. The decision to use real wolves, not hybrid dogs, adding ten days to the shooting schedule. The determination of three friends to tell a story of love, friendship, discovery and respect. And their insistence to stay true to a screenplay and make a movie they believed in and could be proud of. At the 63rd Academy Award ceremony, with a total of 12 nominations, Dances With Wolves became the first Western film to win an Academy Award for Best Picture since 1931. The movie was also awarded Best Director, Best Adapted Screenplay, Best Cinematography, Best Film Editing, Best Sound and Best Original Score. In addition, the movie received the Golden Globe for Best Motion Picture, Best Director and Best Screenplay. A Silver Bear for an outstanding single achievement and various recognition from the American Film Institute. In 2007, the Library of Congress selected the movie for preservation in the United States National Film Registry. Dances With Wolves has to date earned $424 millions internationally and is the top grossing western in movie history. More importantly, however, is the fact that it provided a voice to Native Americans, enabling them to take pride in themselves, their people and their heritage. It broke with Hollywood cliches and stereotyping that for too long had been the norm. And it forced us all, while part-taking in the experience in the movie theatres, to acknowledge that regardless of religion and race were are all humans. Michael Blake wishes to extend his condolences to the family of Jake Eberts. Dances With Wolves was just one of many distinguished films produced by Mr. Eberts. 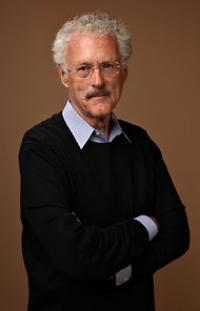 His producing credits include other award-winning films such as Driving Miss Daisy, A River Runs Through It, and the animated hit; Chicken Run. As an executive he was in charge of such productions as Ghandi, The Killing Fields, March Of The Penguins. His films won a total of 37 Oscars. Dances With Wolves financed. Not only did Jake get our movie made, he gave us the creative freedom to make it the right way. It was an honor to attend the 1990 Oscars with Jake and I will miss the man as well as the movie-maker."